Public Transport that turn up late can be incredibly frustrating, and if it happens regularly and severely enough, it can put people off using PT services altogether. Monitoring if buses are on time is therefore a vitality important task for AT and if done right, can help identify where there are issues on the network or with how operators are doing their job. But correctly monitoring if buses turn up on time, also known as punctuality, is something that we’ve always struggled with and continue to do so. Long-time readers may recall that in the past, Auckland Transport published each month punctuality and reliability (if buses turn up at all) statistics that would make a tinpot dictator proud. That’s because the results were based entirely on self-reporting by the operators. The foxes were guarding the hen house if you will and as such we would regularly see ridiculous results. The operators would tell AT they had over 99% of buses on time. Any regular user would likely instantly laugh at you if you tried telling them that result was accurate. Then mid-2014, Auckland Transport mixed things up by moving to calculate the results based on the buses GPS location. This comes from the same system they use to display information on realtime signs. This had an immediate impact, dropping the results from 98.42% in June 2014 to 90.53% in July 2014. The number has improved in the last few years but it remains in the low 90s meaning that almost 1 in every 10 buses is late. But while things have definitely improved from the old self-reporting days, we still have major issues with just how the number is reached. This is best explained here from AT’s stat’s report. Punctuality is measured by the percentage of total scheduled services leaving their origin stop no more than one minute early or five minutes late. In other words, as long as a bus leaves the first stop within 5 minutes of its scheduled time, it counts as one time. The major problem with that assumption is that most people don’t get on at the originating stop but further along the route. As such, by the time the bus reaches people further along the route, it could already be significantly late. The other PT services are now measured this way too, although for rail at least, AT also still publish the data using the old methodology – which counts services based on when they arrive at their destination vs the timetable. How we count reliability is something I’ll come back to. Yesterday the herald published the results of an OIA by the Green Party into just how late buses are. What’s interesting is they had AT break the results down by route, allowing us to see just what the bad routes were. 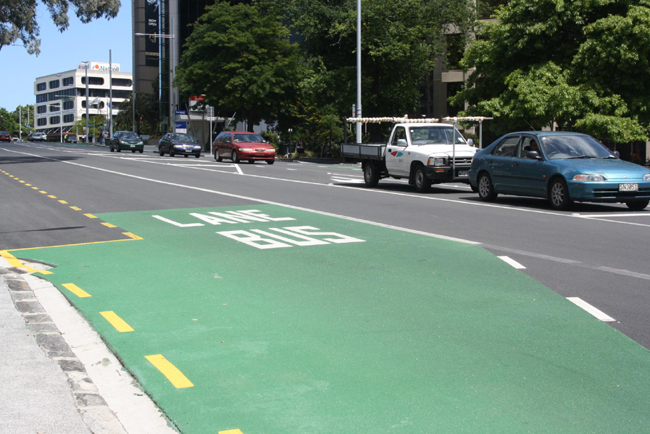 With so many routes in South Auckland near the top of the list, surely its time for AT to start putting in some bus lanes around the place. So just how could/should AT be reporting punctuality? One option would be to adopt the strategy of Transport for New South Wales. Here’s how the bus operators reliability KPI is determined. What I like about this method is that is that that it takes three measures into consideration for more a balanced result. This means its not just counting if a bus left on time but that it was also on time during it’s journey. This surely wouldn’t be too difficult for AT to do. AT could report even more detailed information. Thomas Lumley recently built a small bot to check punctuality of the real-time info vs the timetable and tweet the results every 15 minutes. For an explanation of the bot, it’s worth reading Thomas’ post on the matter. I don’t recall having seen the percentage on time over 80% since the bot started tweeting on 21-Jan and I’d suspect this probably better reflects people’s experiences with the bus network. Either way it’s clearly possible to report the results better. Ultimately the thing that causes the most for buses to run late is other drivers on the road – also known as congestion. The solution to that of course is to put in more bus lanes so that buses don’t get caught up in it. The map below is a year or more old now but shows where bus/transit lanes exist or are planned. On the isthmus there is generally good coverage of bus lanes, although the existing lanes could still be much better than they are today. What do you think about bus punctuality and how should AT report it? It’s important to keep in mind that some providers build in so much redundancy that while their punctuality stats look good, the user experience suffers greatly. A good example is Birkenhead Transport who allow 40 minutes to travel from the city to Beach Haven, off-peak. The journey should take approximately 25 minutes but in order to maintain headway, the 973/974 regularly stops at Highbury Shops and Verrans Corner for up to 10 minutes. It is exactly the case with train. Instead of running in highest efficiency, the train slows down to match the timetable, so that it is always ontime. Therefore I highly doubt the necessary of a fixed time table for frequenct turn up and go routes. The frequent turn up and go routes should really only need a minimum frequency per hour KPI, as well as a real time board for people to see how far the bus is away. Yes just noticed my western line train being delayed at Grafton station to match the timetable only to then be delayed by signals on its’ way to Newmarket. My service had four consecutive 30-35 second dwell times this morning and then back to 50 sec this afternoon. What’s the cause of the difference? Is it the mid-wagon ramp time? If you mean Grafton to Newmarket the delay is generally caused by waiting for a slot at Newmarket. Its not because of trying to allow the timetable to catch up. Hence talk of more frequent services is dictated by the ability, or lack thereof, to move through junctions like Newmarket. Okay, fair enough. I was watching the TM outside my window looking at the electronic arrival/departure board to hit due for our service before he would close the door. Probably for Newmarket as you say. The main point was those dwell times. They were fast and efficient for four stations in a row. It can be done. One or two of the drivers have said that they are only running on half throttle because the inter-station running times are so slack. It’s also frustrating when PT leaves early when you are rushing to catch it at the last second. Three times out of five this week, the early bus I try to catch off the train left early – only 15 seconds in two cases, 30 in the third. I was about five seconds away at a run in each case, to see the bus pull away. The next bus is scheduled for five minutes later, but because of its route, I am 8-10 minutes later getting to work – annoying! Absolutely! Early buses have been a bigger nuisance to me over the past few months than late ones. I don’t mind my bus being a few minutes late, but early is very BAD, you have potentially wait 1 or even 2 hours for the next one. Unfortunately AT doesn’t help, saying buses can be 5 min -/+ to the timetable and their performance metrics are only based off the first stop rather than all the stops. I’ve seen buses as much as 25 min early, its just ridiculous, what purpose does this serve, and how are transfers supposed to work in such an environment. PTOM doesn’t seem to have changed anything either, HBC and South NN’s still have buses running ahead of timetable, without consequence it would seem. Are you sure they can be early? I’ve complained to AT about early leaving buses and they’ve confirmed that the buses in question did leave early and they shouldn’t and they’ve had a word to the operator (and they stopped leaving early). This only works if it is the initial departure stop though. Yes as long as its not the initial stop or a “bold” stop on the timetable they are apparently allowed to be +/- 5 min. 5 min late I can live with, but early? Nightmare. Also many drivers ignore the “bold” stops too. South Auckland routes-many new routes and two new operators. What were the figures like with NZ Bus who had years of experience in South Auckland. I know you don’t like hearing this but bus efficiency (and all traffic for that matter) would be increased substantially, not by imposing under-utilized bus lanes that waste a lot of realestate, but by having all arterials marked as two lanes each way (no under utilised T3 nonsense either) with 24 x 7 no parking. Bus only lanes throughout the city are largely pointless as they invariable get caught in the mix at some stage and delays occur. Get ALL traffic moving and buses will move faster too. A concession to buses could be a ‘Bus Goes First’ rule when they pull out from stops. No problem with that, works well in many smarter countries. Do you live in an alternate universe where black is white and the sky is green? Can’t think of any other reason for the consistent nonsense you post. Your assertions have been proved wrong time and time again. A bus in mixed traffic will never flow better than a bus in a dedicated bus lane. Even allowing a few vehicles in makes things worse for everyone. For example when the Tamaki Dr bus lanes were converted back to T2 for political reasons, studies showed the road was less efficient. That’s because when a bus pulls into a stop T2 drivers would push into the neighboring lane to pass the bus and slow the general traffic down. Then at intersections they would hold up buses. The only group to benefit was T2 cars, everyone else (bus users, other road users) suffered longer trips. Cleary Ricardo doesn’t understand traffic engineering. Vehicle flow is constrained largely by intersection capacity, not the number of lanes between the intersections. A second lane leading to the same intersections will not magically make everything flow, you simply get two gridlocked lanes instead of one. Even in the best circumstances an extra lane of vehicular traffic adds only 600 or so vehicles per hour of capacity, in cases with constrained intersections it adds nothing. We have constrained intersections. This has been proven empirically, Our roads with bus lanes move more people with exclusive bus lanes than when they had two traffic lanes and no bus priority. All that Ricardo’s thoroughly researched scheme would do it make all the traffic and the buses go nowhere. more lanes at intersections increase the throughput and efficiency of intersections. if the lanes are under utilised then the intersection performs less than it can. If there was one continuous lane through all roads and intersections then the dedicated to buses then this would allow the buses to run much more efficient. However, that is not achievable on the majority of Auckland roads due to merges, parked vehicles, tapers, lane shifts that all massively reduce efficiency and throughput significantly. this can be seen all over the place with passing lanes, ramp signals and when merging out of the stops. Most people use vehicles so to get the maximum efficiency for all people, particularly people who cant use the bus, the available road space should be used more efficiently and increase the number of them available to general traffic. This would provide a net benefit for everybody. Simply giving buses priority whilst hamstringing everybody else does not provide net benefits, which is even more of the case when you look at how many of the buses run empty through most of the day. What Ricardo said makes sense if it is about moving the most vehicles but the goal of mass transit is to move the most people. Yes but in most cases in Auckland it wouldn’t even move more vehicles as the intersections are at capacity. Honest question: How do bus lanes help if the intersections are at capacity (given there is no bus priority at most of the intersections)? If the intersections are at capacity and are tailing back into the midblock then bus lanes allow the bus to skip the tail of the queue. PS bus priority can be extended through intersections. Yeah so the buses get a queue jump, past the tails of traffic to within a few tens of metres of the intersection. Usually they are also allowed to proceed ahead from the left turn lane which makes that work pretty well. So you get much faster buses because they can run at their normal speed rather than being clogged up by traffic. This means bus trips are faster and more attractive that driving, and it also increases the capacity of the bus route (if a bus is twice as fast, it can do the run twice as often in the same time period, which means twice the number of seats). Of course giving buses a lane right through the intersection works even better. They you are taking away capacity from a few hundred vehicles per hour, to run buses that can move a few thousand people per hour. That lane changing ‘friction’ is a major cause of congestion (witness any busy on ramp onto any busy motorway). Clearly the only way we can engineer this out is to not allow lane changing or merging. Once you are on a road you must remain on it until the end, having joined it at the start. Congestion cured! That’s essentially Braess’ paradox in a nutshell. Adding a link/capacity to the network can increase average travel times. Braess’ paradox is utter crap. It relies on the unrealistic assumption that there is one route where delay is virtually independent of the flow level and one route where the delay is highly dependent on the flow level. You then divert traffic from one to the other and hey presto total delay goes up. Is that unrealistic though? Delay on a route at saturation is highly dependent on flow, delay on a route far under saturation is locally independent of flow. Braess’s paradox is mathematically quite sound. The question of interest is how often those conditions are found in the real world. That is a question worthy of investigation. Actually the examples I recall have equal traffic on the links, but it’s been a long time and I’ve forgotten all my stochastic queuing theory. Like many mathematical examples, scaling them up from the solution or explanation of a simple to the context of explaining a larger network or problem is complicated. Nevertheless, the simple stuff is useful as it allows you to draw comparisons between systems that look different. Yesterday I needed to travel west, I got to my bus stop and waited for the bus, it did not appear. I assume the bus I wanted was early as the three other bus that passed the stop were. I got on the next bus which was running 3 minutes early, The traffic was light as it was midday. Though a bus lane was available the driver rarely used it, by the time it got to Pt Chevalier it was very early, unfortunately 2 girls got to just before a stop and put their hands out to indicate to the driver but he was in the middle lane, and sailed past. During the day a worse issue with buses is them being early at the intermediate stops as the wait for the next bus can be very long. Bus lanes may improve overall timing but drivers need to be more aware of the times for intermediate stops and stop when they are early. Trains tend to be better but even they run early with people missing a train because it was 2 min early, but at least these are frequent services so another one is not far behind. Of the options provided Option 2 would be better, but I would suggest that the timing is for every stop as this is more realistic to the user. In the east where I live, we urgently need dedicated lanes, when I get off train at Panmure I often have a 20 – 30 minute wait to get on a crowded bus to Howick. System is only as strong as weakest link and right now that’s buses. Yes, good point. Also I’ve found that the counter peak service 505 I want to use in the morning coming from the city fairly early just before a lot of traffic can be ridiculously super early with not one on it as it’s probably so early no one caught it so the problem compounds. It’s worse with the light traffic conditions in January so was something like 15 mins early. We know where the buses are at a given time. We know where busses should be at a given time. Combine the data and then we have a distribution of times that the passengers boarded versus the timetable, and can set targets and track results based on resl customer experiences. That is exactly it. For the average customer journey how far does the bus deviate from the timetable. As suggested elsewhere there should be a peak and offpeak number too as I suspect the same route would be used differently at different time (CBD commute at peak, local shopping offpeak for example). Is there a real-time reporting system/api? When I was living in Budapest last year I often used “Budapest Public Transit” which was a third party app . In fact if you google “budapest bus app”, the first result is “five great apps to use…”. This app was very good for “do I need to run” planning – walking down the street, pull out your phone and couple taps let you check time to the next bus vs walking time to the stop. It was easy enough to use even when carting kids. You could also easily check the timing for your next bus route and if you needed to hop out of the bus faster. There was an uber like map where you could see where ever bus was in a specific area. Generally I used Google maps for route planning and this app for real time info. Haven’t been able to find a similar app for Auckland, and I’m not sure if it’s because the API is not good enough or it hasn;t been written yet. Tried the AT Track My Bus App? The “Auckland Transit” app has been around for a while. Kiwi Transit used to be iPhone only but it is now available on Android. I seem to remember another app which shows buses on a given line in real time. BusWise appears to have stopped working over the summer break? Yeah for me the buses positions keep freezing across the entire map, tried clearing app data/cache, re-install, restarting… no change. Work flawlessly for months before. Stopped around December I think? Just downloaded again working fine again. For a while just wouldn’t connect at all with server. I found Auckland Transit a bit clunky to use. I’ll have to try BusWise. I think these punctuality figures are so AT can measure how well the operator is doing. You can’t really blame the operator for bad traffic can you? So really measuring the time leaving the origin is the best you can do. Even then it is a bit unfair on the operator if a bus gets stuck in traffic and that causes the next service to leave late. The point isn’t to blame the operator but for AT to actually report a more realistic situation with the buses. Reporting 95%+ on-time running is creating a culture of complacency at AT about this issue. Do they have a team dedicated to developing fixes to improve bus reliability? My guess is no. They have a team focused entirely on altering light phasing to maximise car flow in the central city during the CRL construction, where’s the equivalent team for buses? Politically it also becomes difficult to justify resources going into improving bus reliability if AT is reporting 95%+ of buses always being on time, but it’s also pretty insulting as a bus user who experiences frequent delays to have your experience invalidated by AT claiming publicly all buses run on time–they’re guilty of #alternativefacts in my mind. It’s just another convenient way for AT to focus on cars, where they have vast amounts of data and put vast resources into portraying all the delays drivers supposedly experience. To be honest the requirements for operators don’t even need to be made public, it is between AT and the operator. The relevant measure for the public is how reliable are the bus services AT provide. Lack of reliability could be to do with poor provision of bus priority, poor timetabling or poor running by operators, I don’t really care which one, they are all AT’s problem to solve. Unsurprisingly, the all time high for buses running on time was January, when there are the fewest cars on the road and weather is (generally) pretty good. The Link bus routes are appalling and AT does not seem to realize that simply adding more buses to the route will actually improve frequency or punctuality. It will require significant (but simple) implementation of bus lanes on these routes. I catch the bus from Avondale and routinely find buses arriving late because they end up bunching together. 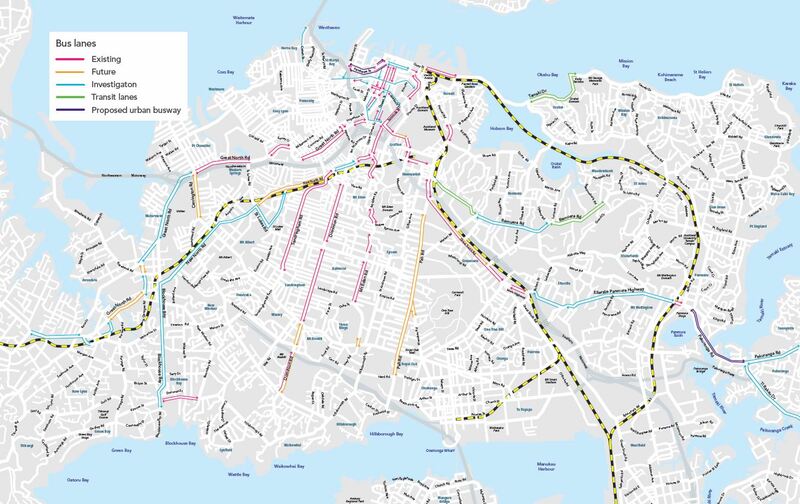 It is pleasing to see that further bus lanes on Great North Road are under investigation because this area is bound to get more congested once the Waterview Tunnels open. Additional measures such as reducing the number of bus stops, making HOP cards compulsory at peak time and the implementation of New Network will hopefully improve things. There are an unlimited number of valid reasons for a bus to run late but only one (non-valid) for it running early. I should comment about leaving early – in the situation I am complaining about, the problem is leaving early from the start point. Obviously depending on traffic, the bus may be early at various points along the route, but the checkpoints should, it seems to me, be strictly observed. The problem is that if the timetable is unrealistic in the first instance strictly observing it makes the service even worse. Inner and outer links are prime examples. They either horribly late or waiting at the timing stop. Obviously having proper bus priority measures would help a lot, but somehow AT prefers to slow down the buses instead. Wrong. If x number of buses run late then y number of buses need to run early to equalise the overall time lost. There’s one point I’d like to add, though: if the ‘first-stop’ punctuality isn’t a useful statistic (and I agree it isn’t for passenger experience), it’s also not a reliable sign of whether service is actually worse in south Auckland. How old is that bus lane map? It shows lanes in both directions through GNR waterview as “investigation”. A northbound lane is supposed to be completed as part of the waterview tunnel works, so should be completed this year. Bus lane flagged for construction in waterview connection project update. The “padding” of the timetables is terrible. I’ve raised that with AT since they’ve introduced ‘timing stops’ on 049 going from the city via Te Atatu Peninsula to Henderson – now the 049 waits in Te Atatu Village sometimes for 7-10 minutes to resume its schedule. Terrible customer experience. The bus, even in normal afternoon traffic (ie. congestion) has not problems meeting the timetable. It supposed to take 50 minutes to travel 16km, the run used to be made in 40mins tops. The same in the mornings – even in heavy traffic the bus is usually 10-15 minutes ahead of schedule in the city. No wonder that they’re never late. AT is happy to add more time, but never to remove. Since the bus shoulders were open on SH16 the trip time to the city came down by 10-15 minutes. In the other direction – currently some express buses run 20mins ahead of schedule consistently. What this really messes with is transferring from one route onto another – the published timetables are virtually useless. One can only hope that a bus comes eventually, but whether that’s the scheduled one or the next one is impossible to tell. That must make transferring from/to services in South Auckland a really problem (especially to the low frequency ones). Exactly.what used to be a 20 min one bus journey from mangere bridge (western side) to otahuhu now takes an hour. You have to transfer from a frequent service to an infrequent one our vice versa. Same applies from the airport to mangere bridge although both are infrequent in that case. “What you measure is what you get”, 8-). The personal feedback on western buses (new north etc) is that at peak user “impressions” are that they are > 95% late. The buses bunch, are too full to stop at intermediate stops, and generally are a good way to late arrive. They are fine when it is quiet of course! Personally, of course I just take the train. Yay for trains! Let’s say I decide to go to the Botanic Gardens, right? That’s a stop roughly half-way between the two end points (Manurewa and Manukau train stations), but it’s also every half-hour and doesn’t really line up with the trains (at least, on the Manurewa end) so specific timing matters to this hypothetical me. What good is it to me, when making plans, to know that the bus typically arrives at the destination on time? There’s just no particular reason to believe that being on time at the end point means the bus was on time at the stop I care primarily about. For instance, maybe some days we get a faster run through Charles Prevost Drive or whatever it is called and whiz through the roundabouts… thus catching up with where we’re meant to be. On the other hand, it’s not a totally useless thing to know. Maybe I live in Manurewa and catch the Gardens bus to Manukau Train Station. In that situation why do I care that the bus is almost always late to the Gardens stop? It doesn’t affect me. It seems to me that deviation from the timetable is the fairest means of measuring reliability. That way, for instance, we could know that the bus is typically a minute early at the Gardens stop and a minute late to Manurewa. That knowledge is relevant for all users (as far as I can see, anyway), not just the end-to-end bus catcher. This seems to be Lumley’s process. And why is it that I once had time to walk, what, thirty metres to a stopped bus (the 33 just south of PB tech in Manukau if you care) and thirty metres past it and then run back and catch it? (The numbers should not be taken as gospel.) These comments suggest the answer is because the timetables aren’t properly “calibrated”, but I think the above is true even with “good” timetables. Lining them up with the trains properly would be a great help, as this is a journey-type where better measuring helps especially. It may be worth removing inset bus cages on particularly congested routes, removing the need for buses to manoeuvre into/ out of the cages and compete with SOVs that try to inch past them or refuse to let them in.